Shrek makes his blog debut! This is one guy that you don’t want to underestimate and he’s as deadly as they come! With a single punch he can wreck some pretty intense havok! The Hulk is still too powerful for him though and takes the win in this round. Hulk wins. 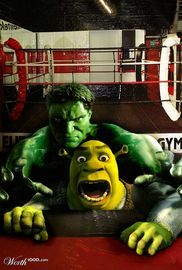 This entry was posted in Battles, Hulk Battles, Shrek Battles and tagged Hulk, Shrek by dreager1. Bookmark the permalink. As someone who likes Shrek, I doubt he’d have a chance against Hulk.